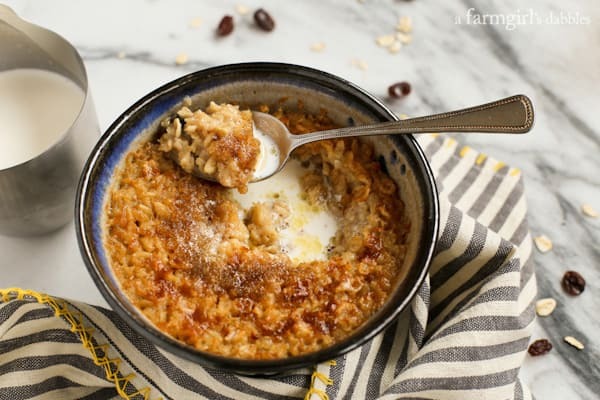 Drizzle a bit of warmed half and half into your bowl of Make Ahead Buttery Baked Oatmeal for a breakfast you’ll wish would never end. Each year, as I try more and different ways to enjoy a bowl of warm morning oatmeal, I fall further and further in love. My overnight baked apple oatmeal with crunchy brown sugar streusel is the recipe that shook my oatmeal world. Ever since, I’ve been on a quest for more. And when a friend heard that Blake and I were going to spend a weekend at Canoe Bay last October, she said, “You HAVE to try their baked oatmeal. It’s amazing!” And you know me. I most certainly did. Canoe Bay was very gracious to let me share their wonderful recipe here on a farmgirl’s dabbles. 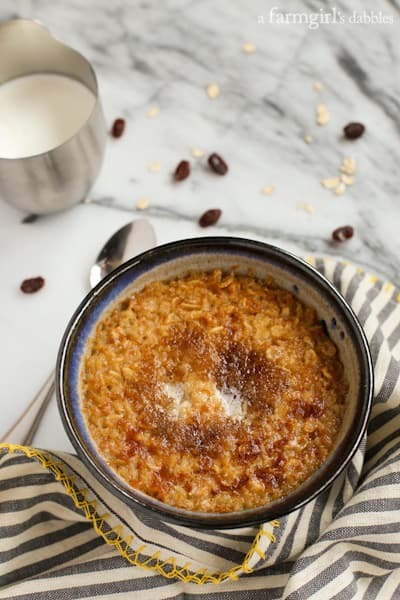 I hope you like this Make Ahead Buttery Baked Oatmeal as much as I do! This bowl of baked oatmeal comes hot from the oven, not haphazardly thrown together by means of a little paper packet and a microwave. 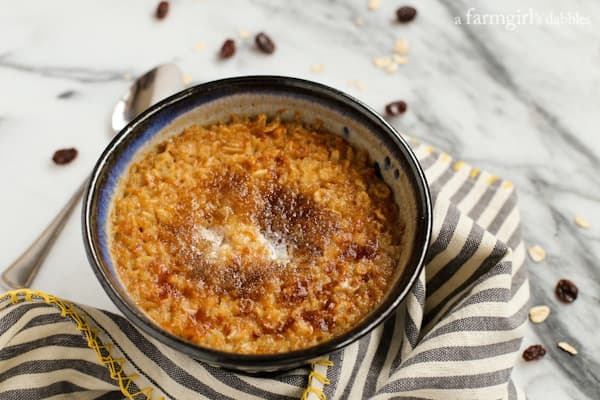 And with just one bite, it’s even more evident that this is not your ordinary oatmeal. It’s luxuriously silky and sweetened with brown sugar and plump raisins. But its most wonderful quality? It’s what sends this recipe for make ahead buttery baked oatmeal over the top. At Canoe Bay, their kitchen makes this recipe in a large dry bulk amount. I have cut the quantities back, more suitable for a family. It comes together quickly in a large bowl, with just oats, dry milk, brown sugar, raisins, cinnamon, and salt. 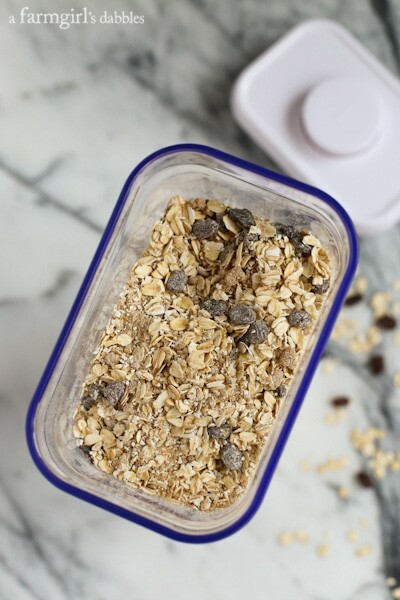 I found that this POP container from OXO is just the perfect size for this recipe, and fits right in next to our cereal boxes in the cupboard. Have you used these POP containers? I think they’re awesome! When ready to serve, butter and boiling water is stirred into the dry oatmeal mixture. And then, when it’s baked and golden and bubbly, a bit more butter is added to the top along with some more brown sugar, and then broiled for a minute or two. 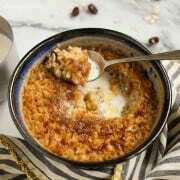 This creates an almost brûleéd-like top to the oatmeal, one that actually crackles a bit when your spoon pushes through. With a bit of warmed half & half drizzled into the oatmeal divots, it’s one of those magical moments that you hope will never end. *** Note that this recipe makes a large amount of dry oatmeal mix, for easy prep of individual servings on busy mornings. 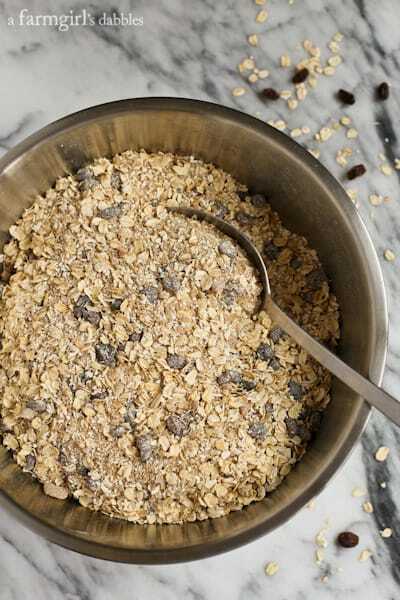 Prepare the dry mix in a large bowl by stirring together the oats, dry milk, brown sugar, raisins, cinnamon, and salt. Transfer to an airtight container to store. This 3.4 quart POP container from OXO works great for this recipe amount! Preheat oven to 350°. In a medium oven-proof bowl, combine 1-1/4 cups prepared oatmeal mixture, 1 tablespoon butter, and 1 c. boiling water. Stir. Bake for 20 to 25 minutes, or until a bit browned and bubbly at the edges. Remove bowl from oven and place 1/2 tablespoon of butter on the top center of the oatmeal. Sprinkle 2 teaspoons brown sugar over the butter. Turn on broiler and return bowl to oven, broiling until the butter and brown sugar on top caramelize and bubble. This should take just a minute or two. Remove from oven and serve with warmed half and half or milk, if desired. Preheat oven to 350°. In a small oven-proof bowl, combine a generous half cup prepared oatmeal mixture, 1/2 tablespoon butter, and 1/2 c. boiling water. Stir. Bake for about 20 minutes, or until a bit browned and bubbly at the edges. Remove bowl from oven and place 1 teaspoon of butter on the top center of the oatmeal. Sprinkle 1 teaspoon brown sugar over the butter. Turn on broiler and return bowl to oven, broiling until the butter and brown sugar on top caramelize and bubble. This should take just a minute or two. Remove from oven and serve with warmed half and half or milk, if desired. Recipe adapted from the baked oatmeal recipe served for breakfast at Canoe Bay, near Chetek, Wisconsin. Reprinted with permission. Blake and I arrived at Canoe Bay late in the afternoon one Friday last October, ready to celebrate our 15th anniversary. 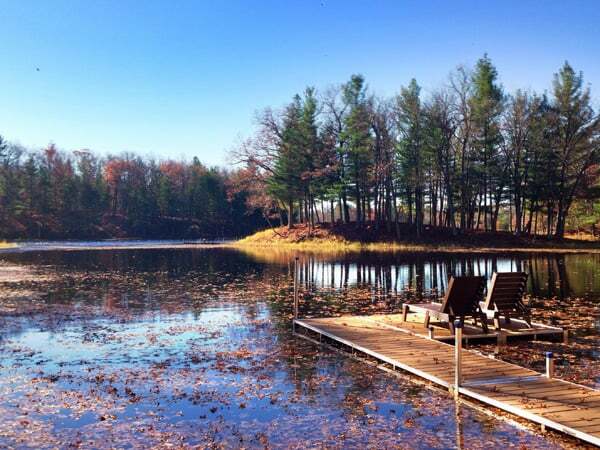 Just a couple hours’ drive from the Twin Cities, out in the middle of beautiful rolling Wisconsin lakes and woodland, it’s an easy drive that makes you feel like you still got away from it all. 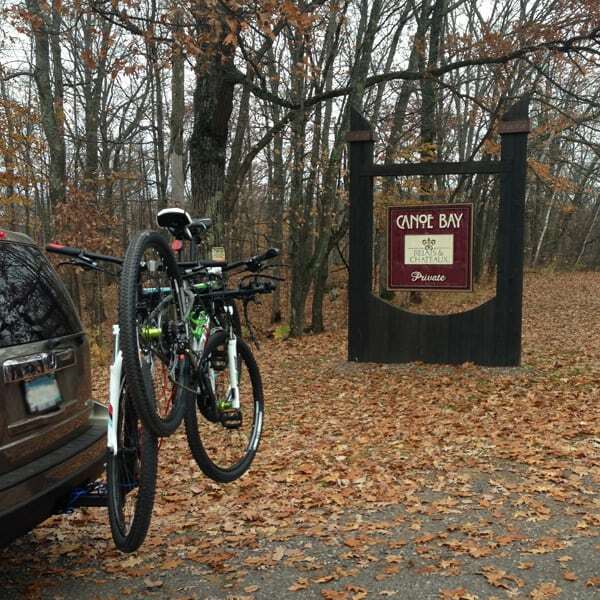 We loaded up our bikes, along with some books, playing cards, and a cribbage board, excited to check out this place we’d heard so much about. 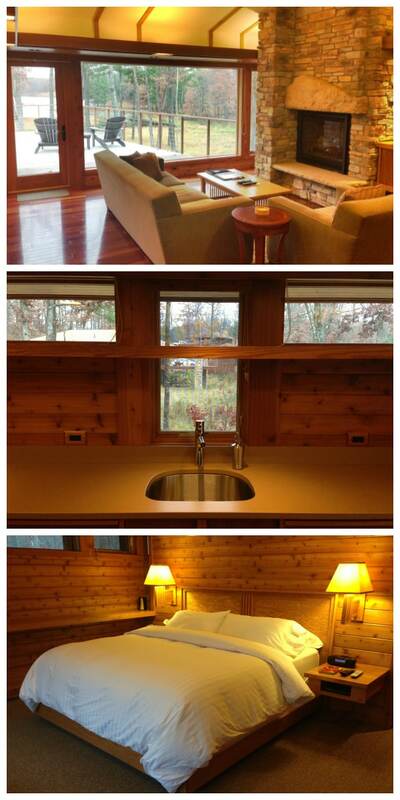 We stayed in one of the stand-alone Dream Cottages, actually designed by an architect that I work with at SALA Architects, Kelly Davis. 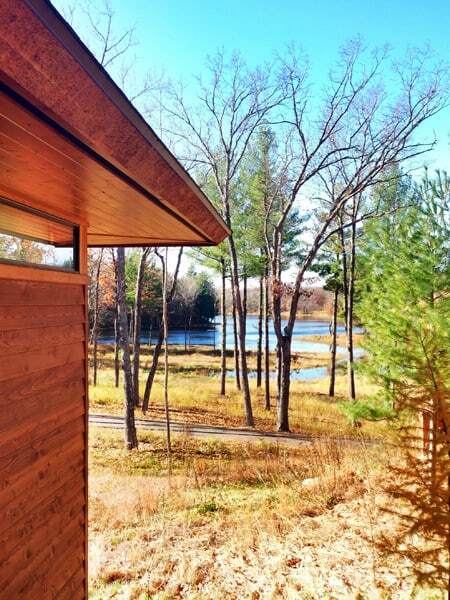 I’ve walked through a number of homes designed by Kelly and Tim Old, and am always impressed by their simple efficient details and beautiful use of natural materials. This cottage did not disappoint. Every. Little. Detail. So well thought out. 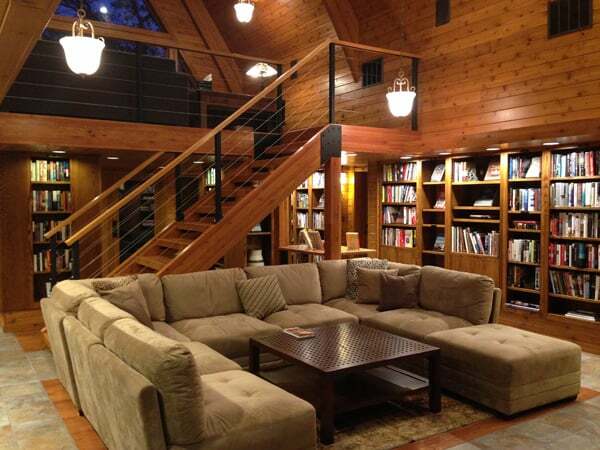 That first evening, Blake and I walked over to the Lodge to check out their extensive library and movie collection. 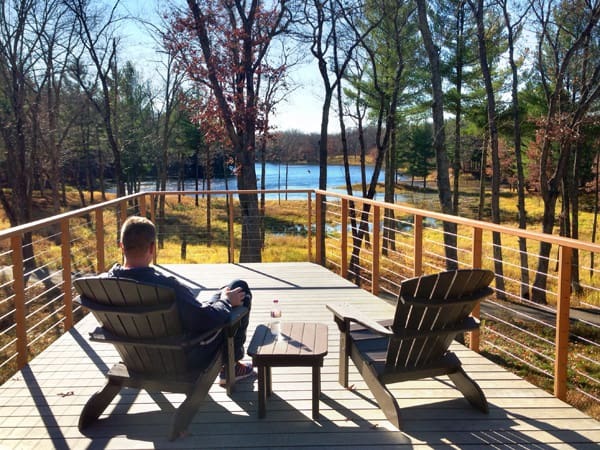 This space turned out to be a great place to relax in a comfy chair…and to reply to an email or two, since it’s one of just a few spaces on the property that have WiFi. We woke up Saturday morning to sunshine and blue skies. Much of the fall color had just recently fallen away, but there was still plenty of beauty to take in. 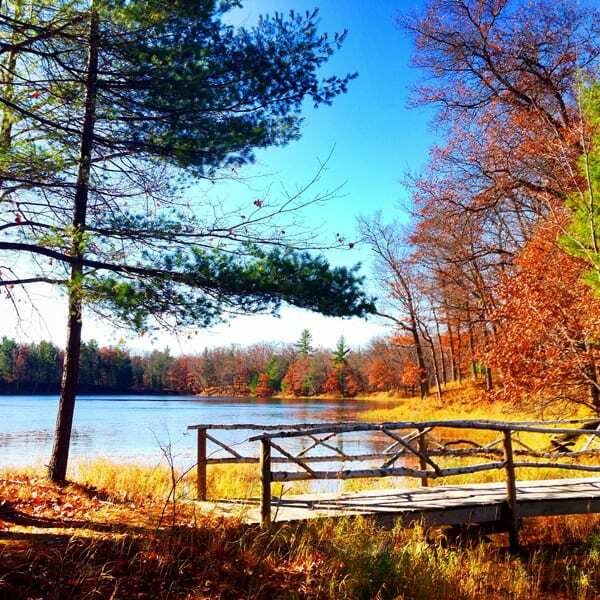 I can’t imagine that any time of year at Canoe Bay isn’t just plain lovely. This place is known for its excellence, and it’s apparent wherever you are, whatever you’re doing. Breakfast and lunch arrived to our door each day in a beautiful wood box, designed by a local Mennonite woodworker. This was how I experienced my first taste of Canoe Bay’s baked oatmeal. We ate dinner in our cottage one evening – cheese and crackers, wine, and chocolate, while watching Casablanca for the first time, a DVD from the Lodge’s movie archives. And the other evening we ate in Canoe Bay’s dining room. It was a wonderful meal in a beautiful space, an experience that Blake and I would both recommend. We spent quite a bit of time just sitting out on the deck, letting the sunshine and quiet soak in. The blue skies begged us to be outdoors. We went for a bike ride, and then checked out Canoe Bay’s massive garden of raised beds before logging some miles on the walking trails throughout the property. 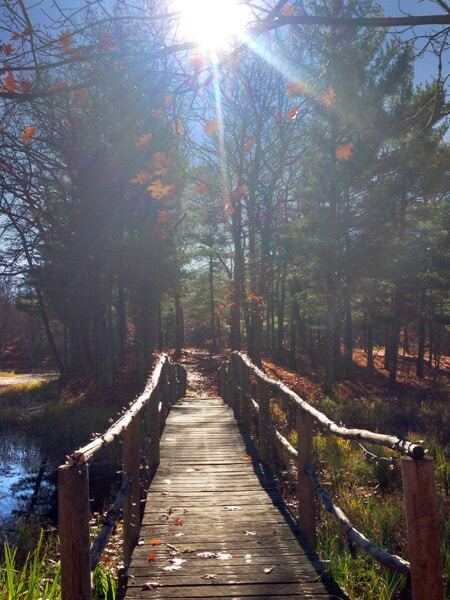 When I was a kid, I always wanted my own little island, with a worn wood bridge access. On the island just beyond this bridge, I learned that when Blake was a kid, he always wanted a mountain. Ahhhhhh…what a little quiet togetherness can do for a couple. This is the image that is burned into my brain from our weekend at Canoe Bay. The island. The bridge. The sunshine and color. The peaceful air that blanketed everything in sight. This place is a little slice of heaven. Be sure to visit Canoe Bay online for more information. On our drive home, we I sought out the pottery studio of Willem Gebben. 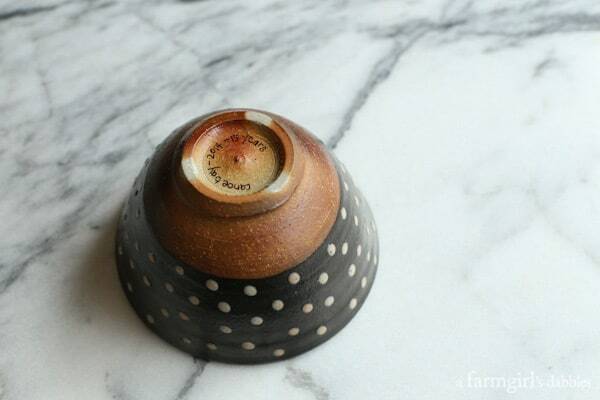 This pottery was featured throughout Canoe Bay – in their breakfast and lunch boxes, in the cottage’s cupboards, and displayed as pieces of art throughout the cottages and common spaces. Gebben’s pottery was functional and pretty, and I wanted to bring home a piece as a memory from this anniversary trip. This is the bowl featured in my baked oatmeal photos at the beginning of this post. I bought one for a friend who loves local pottery, for her upcoming birthday, and one for our own 15th anniversary weekend remembrance. The perfect memento.